OK, so I’ve posted about this before, but hey it’s Christmas, and it’s still one of the great mysteries of musical life: why in the Kingdom of the Sweets in The Nutcracker do you get chocolate, coffee, ginger, sugar plums, and er….reed pipes? Although the mirliton is some kind of instrument (the nearest thing to it is a kazoo), it makes a lot more sense of Konfiturenburg if you know that the Mirliton is also a cake. One, the mirliton de Rouen is a cross between a Bakewell tart and a Maid-of-Honour, the other, the mirliton de Pont-Audemer is bit like a cigarette russe filled with a chocolate praline mousse, each end dipped in melted chocolate to seal the mousse in. Other people want to climb Everest or swim with dolphins, I just wanted, before I die, to see a bloody mirliton, this darned reed pipe or cake, which is on the title page of one of the most famous and overplayed pieces of music in the world, but no-one could ever show me. Well, I’m happy now. Firstly, over at Louis La Vache’s recipe page, there is a picture of a real mirliton (the instrument) and a recipe for the mirliton de Rouen. But what Tchaikovsky had in mind is almost certainly not this cake, but rather the mirliton de Pont-Audemer, a speciality of the town of Pont-Audemer in Normandy, allegedly [but disputedly] first created by Guillaume Tirel (a.k.a. Taillevent) in 1340, and still available from the Patisserie Aubry in that town, and pictured on the left. It’s easy to see the relationship between this and the instrument shown on Louis La Vache’s page, right down to the ‘membrane’ of chocolate at either end. 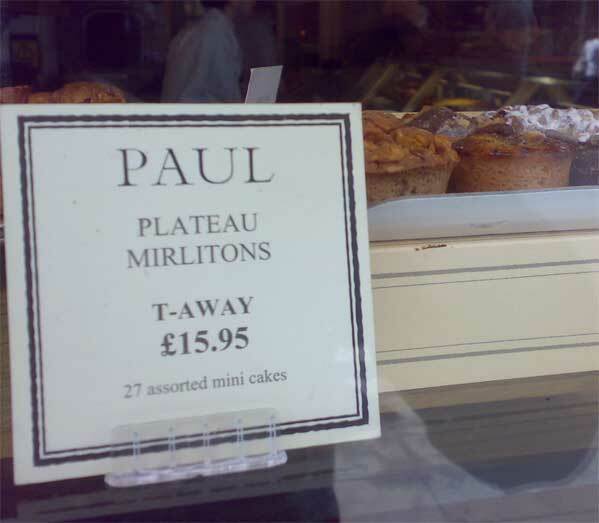 The picture on the left is of a box of these mirlitons from Patisserie Aubry in Pont-Audemer. More on the mirliton from the Pont-Audemer tourism site. This entry was posted in Advent calendar, Dance, Music, Personal and tagged Personal, Tchaikovsky, advent 2009, mirlitons, nutcracker on December 5, 2009 9:08 am by Jonathan Still. Thank you, Mr. Still! I’ve been wondering about this since childhood. And thank you, Google and smartphone .